We’ve become so used to talking about disruptive business ideas it would be easy to assume that revolutionary change is the norm when it comes to process and efficiency improvements. In reality, the ‘big idea’ innovations are rare. And even when they do occur there are many refinements and small-scale improvements needed before the idea is commercially viable and adopted on a wider scale. Most progress comes from incremental improvement. Meaningful and sustained change comes when people carrying out all types of roles are engaged with what they are doing and ready to question the status quo. Looking for the big innovations is still important. But why waste the contribution that hundreds of people coming up with small ideas can make to quality, efficiency and safety? But, how do you capture the creativity of large teams? Particularly when they work across multiple locations, as with infrastructure projects. The other question is how to do something with the ideas you get. How often do ideas get applied to a specific challenge on one project, only to be forgotten by the time the next project comes around? How often do great ideas never get shared beyond the project team that came up with them? And how often do people come up with ideas that they think are ignored and then stop coming up with new ones? To create a culture where incremental improvements can thrive you need three things: immediacy, implementation and recognition. 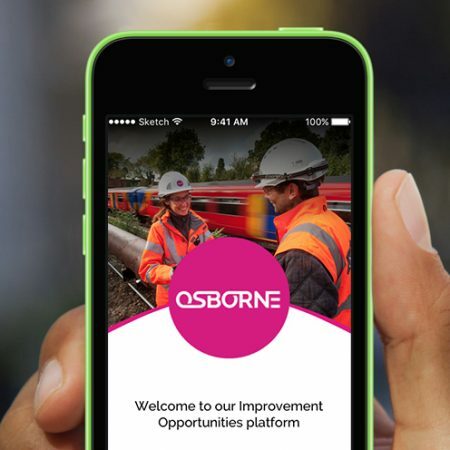 Osborne’s Improvement Opportunity (IO) app and the process around it delivers a process to bring all three areas together. The App works on any desktop or mobile device. Our teams can capture ideas as they have them and submit them very simply into a formal review process. There is a structure in place to review suggestions and provide feedback to people who came up with them. Progress can be tracked via the app. There is always recognition, even if it’s just a ‘well done and thanks’ so that everyone can see that improvement ideas are welcomed, followed up and appreciated. Where improvement opportunities are implemented this is also acknowledged and celebrated. In 2017 we received 7310 improvement opportunities from 566 individuals, with 11% coming from external people. In 2018 this grew to 8710 opportunities from 719 individuals, with 20% coming from outside our organisation. Around 50% of the opportunities are raised using the mobile app. How many of these improvements would we and our customers have lost if we didn’t have an efficient way to collect them or a formal process for reviewing them? This is how positive change happens!